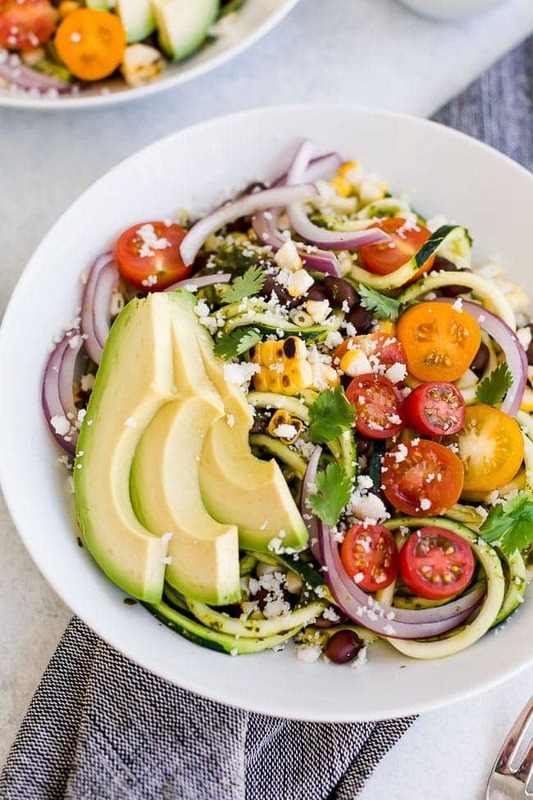 Southwestern Zucchini Noodle Bowls-Zoodles with black beans, charred corn, tomatoes, avocado, and cilantro vinaigrette. You will love this light and refreshing zucchini noodle recipe! Perfect for a light lunch or dinner! My love for zucchini is still going strong, but we are taking a break from zucchini bread and chocolate zucchini cake to enjoy a savory zucchini recipe today. You guys are going to LOVE these Southwestern Zucchini Noodle Bowls. The bowls are light, refreshing, and full of flavor. I have been making these zucchini noodle bowls for the past week and I am in love. I think this is my new favorite savory zucchini recipe. Add this recipe to the top of your list now. You should probably make it for lunch today. Why wait?